In the coming days, the New York Rangers have an easy decision to make regarding Lias Andersson and Filip Chytil. Given the Blueshirts’ unsteady season, just a few months ago the notion of recalling either player would have been unwise, if not unthinkable. 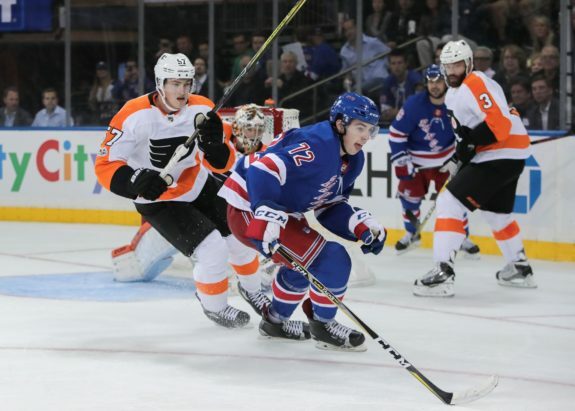 But with neither the Rangers nor the Hartford Wolf Pack—their AHL affiliate—likely to make the playoffs, it’s possible, even likely, both youngsters could be called up to finish the year with the big club. The NHL’s Collective Bargaining Agreement allows 18- and 19-year-old players on entry-level contracts (ELC) to play up to nine NHL games before they officially burn the first year of their respective deals – otherwise known as the “slide” rule. For the NHL, where cost control and the ability to consistently backfill rosters with ELCs is an ever-rising necessity, it’s a rule the Rangers are wise to respect. And respect it they have. Both players are only being considered now that the Rangers won’t needlessly use up that valuable first year. 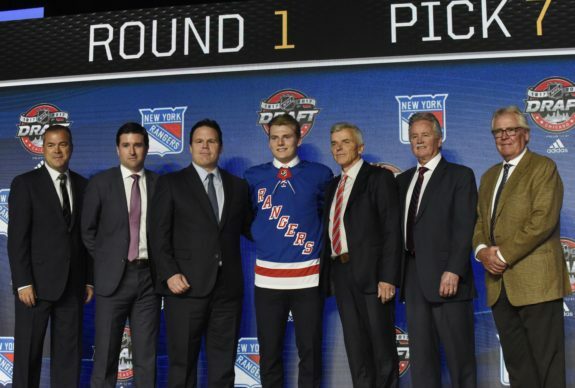 For Andersson, taken seventh-overall in last year’s draft, his NHL debut could come as soon as tomorrow when the Rangers take on the Philadelphia Flyers. Chytil, the Blueshirts’ 21st pick in the same draft, will be slightly delayed, available to return to the Rangers’ roster for the first time since the start of the season next Monday against the Washington Capitals. A recent report from Larry Brooks of the New York Post suggests the duo could be brought up together, though, making Monday’s game the earliest target. Earlier this season, Rangers general manager Jeff Gorton stated emphatically he had no intention of burning the first year of either player’s deal. Had things gone better for the Wolf Pack—now 29-29-5 on the season—it’s possible neither youngster would have been recalled at all this year. Along with Alexandar Georgiev, Neal Pionk, and John Gilmour—all of whom were also recalled by the Rangers this year—the duo would have been seen as integral components for a run at the Calder Trophy. But with the Pack’s chances to make the playoffs ostensibly up in smoke due, in large part, to the aforementioned promotions, the path is clear to bring both teenagers up for the Blueshirts’ final 10 games. While there is still much to evaluate, their development has been stellar with Chytil especially racking up points since his reassignment. Chytil picked up his 11th goal of the season when he scored against Lehigh Valley last Friday night and has 31 points in 44 games this season. He’s fourth on the team in scoring behind Cole Schneider, Scott Kosmachuk, and Peter Holland respectively. His 0.70 points per game played (P/GP) pace is second only to Holland (0.92) among Pack players who’ve skated in at least 20 games this year. Andersson, his partner in crime these last two-plus months, has 14 points in 23 games since joining the Pack in January, a stat line that includes five goals over the same span. His production is equal to a 0.61 P/GP pace, making him the fifth-highest producer for Hartford this season in that regard. With their ELCs firmly intact, the risk in recalling either, or both, is mitigated. Gorton and his front office can get an early look at their progress as professionals and can do so without harming their contractual status, or the playoff hopes of either squad (given they have none). With Mika Zibanejad and Kevin Hayes currently centering the top-two lines, Chytil and Andersson will likely replace David Desharnais and Peter Holland in the bottom six. At that time of year and in the likely position the team will be at in the standings, most NHL head coaches would find opportunities to elevate young players being evaluated. It will remain to be seen how Rangers’ head coach Alain Vigneault handles the unfamiliar task of mentoring a team out of contention. Though the games themselves won’t mean much, there’s plenty to be learned of the young pair’s NHL readiness. In many ways, this year will be seen as a transitional one for the rebuilding Rangers, both metaphorically and literally. With expectations heavy for both players to make next season’s roster out of training camp, strong play down this otherwise meaningless stretch can only help in their development, not to mention the Rangers’ rebuilding efforts.